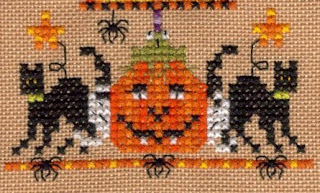 Serendipitous Stitching: Sign up for a Spooky Blog Hop! Sign up for a Spooky Blog Hop! Yes, it is that time of year again, we are counting down to the Spookiest Hop on the Blog. All you have to do is leave a comment here saying you would like to take part. I will assign each person a letter of the alphabet. On 31st October you make a post featuring your letter and a stitched piece relating to Hallowe'en. The stitched piece does NOT have to begin with your letter. I will post the blogs in order and we hop around visiting them, collecting the letters which will spell out a Mystery Phrase. Return to my blog and leave a comment with the Phrase to be in with a chance to win a prize! Quite a few people signing up already but always room for more, we just have a longer mystery phrase! If Hallowe'en is not your thing, the one after will be the Advent Calendar Blog Hop. Everyone gets a "door" to open and posts on their day. I've been Christmas stitching this weekend, the next cube from The Primitive Hare's Christmas Cubes and wow, is this one taking it's time? There are big blocks of colour in this which is not very interesting stitching but will look lovely when it's done. Only three colours left; green for the pumpkin stalk, yellow for the birds' beaks and feet and then some black. It's about half the whole design and will make a nice little scene as it is. I am sure she was called The Crafty Aardvark but I can't find her online at all which is a shame. The canvas is 3D so the beach huts come out from the main frame and as you walk past it they appear to move. Very clever. And a price tag to match! I see presents in your Christmas stitch! Hallowe'en Town is a cute stitch and looks good. Love the dolls - a long time ago I used to collect them until I realised I would have to buy a house just for them if I didn't stop! I think I'll just be a reader for the Spooky Blog Hop, especially since I only have 1 Halloween stitch to choose from. Count me in! Lovely stitching on everything! I don't mind big blocks of colour now and then. Count me in on your Halloween blog hop! What fun! Beautiful Christmas and Halloween WIPs. I left a comment on your other post about the Halloween hop, but just in case you havent read it... yes pls, Count me in, this will be my first Halloween hop, yipee! Count me in for the blog hop. Love the beach hut pic. Nice dolls, I have one that was made by a local crafting group - my family think its weird?? Hallowe'en Town is looking fabulous. Your Christmas Cube is looking great, and I love the Hallowe'en Town. Those dolls are really nice. Lots of great things in this post. It will be fun seeing your Christmas cubes come together. Count me in on your blog hop! I am stitching one Halloween project and it won't be done by then! I'm really looking forward to the Halloween Blog Hop...and the Christmas one. We watched a Christmas Episode on Downton Abbey this week, and ever since then I'm really feeling Christmas-y! Great stitching on your cube. Count me in on your Halloween blog hop! Those are the best dolls. Please add me to the Halloween Blog Hop. Thank you so much. Mentioning your Advent Blog Hop made me think of the fact that I have to take up my advent calendar stitching again. Thanks for the reminder, lol. I'm looking forward to the next blog hops. It's always so much fun to read what all the participants write and what they show. So behind on my reading, but count me in if it's not too late! Cute stitching & those dolls look fun! Love the dolls! I'll play along on the hop. Pumpkin Pie? With a Side Serving of ORTs!